Amazing My expectations for brutal death metal are about as high as my expectations for fast food, just don't mess it up, and this album does just that! ... Mengejutkan banget gempuran fresh Brutal Death Metal Killer asal Rochester, New York yang pernah beberapa waktu lalu Gw Interview saat mereka mempromosikan album full ke-2 nya " Transcend Through Sacrifice ". dan secara memang mengejutkan sajian Fresh Brutal musik mereka mulai kian matang begitu pertama kali gw mendapatkan CD baru mereka " Fragmented Atrocities " yang Full Intense Blastbeat Powerfully !! The formula is pretty basic for brutal death metal, and the whole album kind of lacks any deviation but it's not bad. Like just about every brutal death metal band from 2000 and on, its more about the slams then anything. However the only thing wrong with this album is the production. That's what always kills just about every death metal bands nowadays in my eyes. The drums and vocals are so overbearing they drown everything. The snare is compressed so much that its all you hear when the drum does blasts and it sounds terrible when he does his gravity blasts. The guitars and bass is pushed back and hard to hear expect during the slams. perpaduan antara konsep dasar Suffocation, Cannibal Corpse, Vader hingga Misery Index memang sangat begitu terasa disetiap sengatan Track Kejamnya !! Wuihhhhhh Goodjob buat Drummer Alex yang semakin Mantap Pukulan Serta hentakan Rapat berat twin pedal-nya. menjadi rekaman terakhir bagi bassis Buzz, Materi ini 100% menawarkan intense brutality beat yang mendominasi hampir keseluruhan track ! " Mass Disillusion " yang dimulai dengan Spoking kenegaraan lengkap dengan Tepukan Massa Intro selama 47, kemudian barulah kita dihujam dengan serangan angin tornado Blastbeater killer !!! sekilas memang gw merasakan hawa kejam Vader era album " Litany ", karena memang level Bass drum yang paling mendominasi Level sound menjadi karakteristik materi kali ini lebih terdengar liar dan Brutal !!!! Dinamika struktur musiknya boleh gw bilang variatif dan tidak membosankan walau di penuhi dengan gempuran Hyperblast snare sana sini, namun masih kerap memainkan komponen drumming yang atraktif. Ranging from fast tremolo picks, palm muted breakdowns and fast death thrash type riffs. There is a good variety, and the songs have a good variety in them. They aren't just fast part-faster part-slam repeat until they get bored and end the song. And the vocals aren't annoying after 10 seconds like more death metal bands nowadays. For a guy like the Yeti you can only expect the best. I wish he had some variation but it doesn't take away from the music. Karakter Vokal Grunted Yeti semakin terdengar serius mencoba gaya tajam Frank Mullen nya Suffocation abis. " Engorged Repugnance " kian mematikan saja komposisi-nya. sebuah Brutal Death Album yang sangat megah sekali jika kalian konsumsi sendiri 8 lagu berdarah disini selama kurang setengah jam-an termasuk cover song milik Speed/Thrash Metal/Crossover Veteran lawas asal New York, Carnivore " Ground Zero Brooklyn " dari album fenomenalnya " Retaliation " yang mungkin karakternya agak lebih berbeda dengan lagu mereka sendiri, tapi cukup cool buat kita dengarkan bagaimana, Carnivore akan tampak lebih Ngebut n brutal tanpa banyak menghilangkan sentuhan asli lagunya hahahaha, sound yang siap membinasakan segala angkara murka hasil garapan enjiner Doug White yang kita kenal sebagai Gitaris band Brutal Death Metal sekampung Abdicate, Fledgling Death, yang pernah menggarap banyak album dari Avulsion, Brutal Truth " Evolution Through Revolution ", Warblade, Within, etc rupanya telah berhasil memberi sentuhan dan warna baru pada sound Abdicate jika Gw bandingkan dengan sebelumnya. Dasyat abis deh nuansa yang dilahirkan materi " Fragmented Atrocities ", sangat benar benar keji abis !!! semakin menambah Poin Plus juga, Abdicate menggunakan artwork gory Karya seniman sakit Jonzig, sebuah keseriusan yang siap mereka petik sukses sebagai band potensial di masa depan !! Ancaman baru siap ditebarkan album ini. Its a good CD. It's what you come to expect from this band. The artwork is really nice and really captures the album title. Amazing My expectations for brutal death metal are about as high as my expectations for fast food, just do not mess it up, and this album does just that! ... Shocking really fresh onslaught Brutal Death Metal Killer origin Rochester, New York who had some time ago when they promote Gw Interview 2nd full album his "Transcend Through Sacrifice". and it was surprising dish Fresh Brutal their music began to increasingly mature so the first time I get their new CD "Fragmented atrocities" that Full Blastbeat Powerfully Intense!! 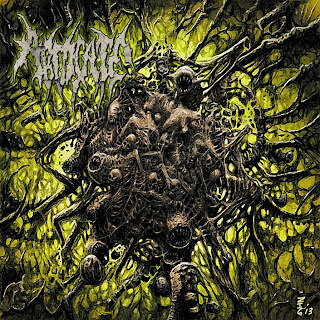 The formula is pretty basic for brutal death metal, and the whole album lacks any kind of deviation but it's not bad. Like just about every brutal death metal band from 2000 and on, its more about the slams then anything. However the only thing wrong with this album is the production. That's what always kills just about every death metal bands nowadays in my eyes. The drums and vocals are so overbearing they Drown everything. The snare is compressed so much that its all you hear when the drum does blasts and it sounds terrible when he does his gravity blasts. The guitars and bass is pushed hard back and expect to hear during the slams. blend of basic concepts Suffocation, Cannibal Corpse, Vader until Misery Index is very much less pronounced in each shock Track Cruelly!! Drummer Alex Wuihhhhhh Goodjob for which the steady beat of Meetings heavy blow And his twin pedal. be the last recording for bassist Buzz, this material offers a 100% intense brutality beats dominated almost the entire track! "Mass disillusion" which begins with a complete state Spoking Intro to Mass pat for 47, and then we dihujam with Blastbeater killer tornado attack!!! i sense the fleeting indeed cruel era Vader album "Litany", because it levels the most dominating bass drum sound level into characteristic material this time sounded wild and Brutal!!!! Structural dynamics should i say the music varied and not boring even in the meet with Hyperblast snare strikes here and there, but still often play an attractive component of drumming. Ranging from fast tremolo picks, palm muted breakdowns and fast death thrash type riffs. There is a good variety, and the songs have a good variety in them. They are not just fast-faster parts part-slam repeat until they get bored and end the song. And the vocals are not annoying after 10 seconds like more death metal bands nowadays. For a guy like the Yeti you can only expect the best. I wish he had some variation but it does not take away from the music. Character Vocal grunted the Yeti sounds seriously try his sharp style Frank Mullen of Suffocation abis. "Engorged Repugnance" increasingly lethal course of his composition. Brutal Death Albums a very grand at all if you consume it himself 8 songs bleed here for about a half hour late, including a cover song belongs Speed ? ?/ Thrash Metal / Crossover old veteran from New York, Carnivore "Ground Zero Brooklyn" from his phenomenal album "Retaliation" which may be somewhat different character with their own songs, but pretty cool for how we listen, Carnivore will look more speeding n brutal without eliminating many original touches song hahahaha, sounds ready to destroy all the claim outcomes insolence Engineer Doug White that we know as Brutal Death Metal band guitarist compatriot Abdicate, Fledgling Death, who had worked on many albums of Avulsion, Brutal Truth "Evolution Through Revolution", Warblade, Within, etc seems to have succeeded in giving a new touch to the sound and color Abdicate if compare with previous Gw. Abis deh feel terrible material born "Fragmented atrocities", so really really nasty abis!!! further adds Points Plus also, Abdicate using gory artwork artist's work sick Jonzig, a seriousness that is ready to succeed as a band they learned of potential in the future! New threat ready to be sown this album. Its a good CD. It's what you come to expect from this band. The artwork is really nice and really captures the album title.